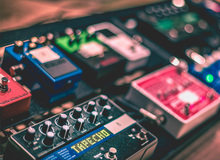 The long-awaited poll regarding "small" guitar effect pedal brands is finally here! It's open season for anybody who likes controversy! Empress Effects has announced their Reverb pedal has started shipping, and requests customer inputs for next feature to be added in a free update. Today and tomorrow, the Eterna reverb pedal is available with a discount from Mr. Black's online store. TC Electronic enlarges its TonePrint range with Sub'N'Up, a classic monophonic octaver pedal.